Just a few weeks ago, Jeffrey Lurie stood behind the podium and argued that retaining Andy Reid representedthe best chance for the Eagles to win a Super Bowl next season. But as Steve Spagnuolo, the odds-on favorite to replace Juan Castillo, chose New Orleans instead, that wisdom comes into doubt. Regardless of playoff results, Lurie was right when he said that the true class of the NFC is represented by the Packers and Saints. Everyone else is playing catch up. And on a day when the best defensive coordinator on the market picked the Saints instead of the Eagles, Reid’s team looks like it’s only losing ground. Let’s be clear. Regardless of the length or seriousness of the talks between him and the Eagles front office, Spagnuolo knew what he’d be getting into in Philadelphia. He knows Reid, the front office, the situation on defense, probably better than he did the Saints job or any other. The fact that he avoided returning to Philly doesn’t bode well for the Eagles organizational health. I would say that Spagnuolo’s preference to stay away represents a certain canary-in-the-coal-mine warning, but we already had that last year when the Reid fell back to Juan “Plan H” Castillo. The head coach has had success luring older, mercenary-type assistants to the staff in the last two years. Bobby April, Jim Washburn, Howard Mudd have all had positive impacts on the team. But Reid has now struck out twice (three times if you count McDermott) in trying to bring an experienced veteran in to run the defense. Lets go back to the Packers and Saints for a moment and their two great offensive-minded head coaches in Mike McCarthy and Sean Payton, not unlike Andy Reid. Both have utilized “defensive head coaches” to win a Super Bowl — Dom Capers and Gregg Williams. 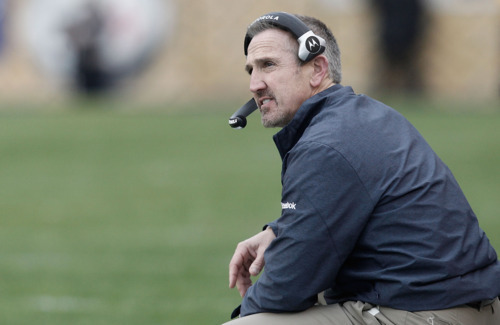 Now Steve Spagnuolo will slide into the spot in New Orleans vacated by Williams. The Eagles used to have a defensive head coach in Jim Johnson. Reid knew his limitations and almost won a Super Bowl with Johnson dialing up blitzes independently from his oversight. Payton and McCarthy have stolen from that playbook, but Reid’s original copy is gathering dust in a closet somewhere. When Reid announces next week that his first choice at defensive coordinator was always bringing back Castillo, not only will he be lying, but it will be an example of how far he’s fallen from the realm of elite NFL coaches, as well as the latest indictment of an organization stuck in neutral. Perhaps next season will provide a rebound playoff year, and both Reid and Howie Roseman will refurbish their reputations. But sitting here right now, it’s tough to be anything but pessimistic about the future of this franchise. Tagged with Philadelphia Eagles, NFL, Front Office, Andy Reid, Steve Spagnuolo, Juan Castillo, Defense, Defensive Coordinator, Super Bowl. January 20, 2012 by Brian Solomon.